If there is one thing that a church building is for, it is worship and as worship is so important, preparing for a service in church takes time and work, with nothing left to chance. This preparation involves servers, sidespersons, bellringers, flower arrangers, cleaners, people who prepare and serve the refreshments after the service and so the list goes on. 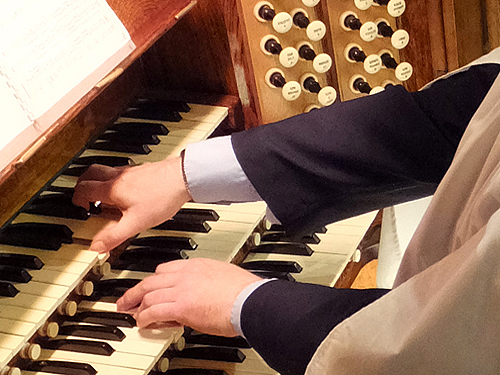 Music in church tends to be very visible - certainly audible! But what you see and hear during a service though is the tip of quite a large iceberg with nine tenths of the work having already happened in advance, usually weeks or months beforehand. 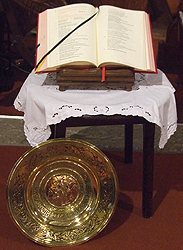 At most services the Gospel is read by the clergy or one of the servers and the other readings by volunteers. The formal prayers of intercession are usually prepared and read by volunteers. 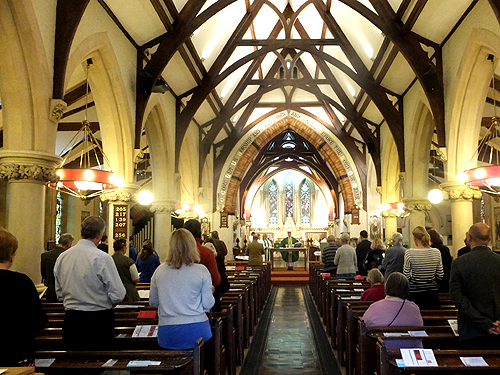 It is not easy to condense the needs of the church, the world and the local community into these five minutes to harmonise with the theme of the collect and readings. It is also not easy to read such prayers in a way that will move beyond performance into a genuine act of collective prayer. It requires preparation - thought, prayer and practice. 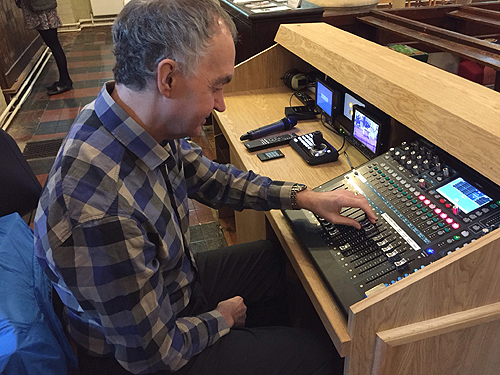 Then not so much behind the scenes as behind our backs - there is the audio-visual system manager who adjusts the microphones to suit the varying voices of readers, intercessor and president, and operates the screen and projector when needed. The equipment is operated from a new console desk at the back of church where there is a digital mixing desk and a laptop to power the audio visuals. The big screen and new sound system was installed at St James's during May 2016 with replacement speakers, state-of-the-art stereo microphones, headsets for clergy and a new induction loop for anyone with a hearing aid. The screen is used to show films, the words of hymns or for a sermon. There is also a camera making it possible to webcast services or concerts.